I was 24 yrs old when I fell pregnant with my second child, and happy to be so, until everything went wrong. The father of my [second] wanted child and I had a falling out and the relationship ended. Unmarried, with no money other than Government funds, I had no choice but to take my 5 year old daughter and move into my father’s small apartment, where misery and fear of the unknown played havoc with my heart. At this time, and for the first time in my life, I found people stepping up to support me. However, the support was offered in favour of an abortion, with thoughts such as “You already have one child” “You can’t afford to have two children” “Two children, two different fathers” - the latter one being offered with a deep frown. What I received more than anything from my 'support’ group was a sense of hopelessness, shame and impossibilities. All the negatives you could come up with came before me, and I bought them. Only, at the time, I didn’t realise I was buying these fears with part of my soul, and the life of my child. I put off making the decision as long as I possibly could. But as the end of the first trimester drew near, the Doctor informed me that if I waited any longer a termination would no longer be possible. So, now, fear blended with pressure, and anxiety shot through the roof. I did not trust my own judgement; did not possess the confidence an adult should have when it comes to making decisions for one’s own life. So, adding up the ‘votes’, I opted for the abortion. With my decision in hand, my closest friend travelled the long train journey with me, taking me all the way to the clinic where the termination would take place. We had been warned there’d be protesters at the front of the building, which added to my fears. I approached the building expecting the worst and doubting I’d have the courage to walk through the aggressive/assertive crowd. However, on arrival, I realised my fears had been a waste of time as there was not one protester there that day. Inside, we were taken into a room where a woman (a counselor, I expect – I don’t remember) wanted to make certain the abortion was my decision. Satisfied with my response, my friend and I were directed back to the waiting room. I sat in that room totally amazed. Struck dumb in my ignorance. Most of the women there looked as though they’d just stepped out of the office for a hair appointment – or perhaps straight off the catwalk. Going by their attire, they all seemed to be financially secure, and for that reason I could not understand why they would terminate their child. I know better now, but at the time I kept thinking if I were them, if I had money – as they seemed to – I would not terminate my child. Soon, I was taken into the operating room and, wearing the appropriate clothing, I had to climb up onto the icy cold table. I laid there, in an unladylike manner, holding my breath as two sets of hands did what they were trained to do. My life, and that of my child, rested in those hands. Then, suddenly, when it was too late to change my mind, every thought that had convinced me this was the right thing to do fled, and before the operation was over I realised I had made the biggest mistake of my life. When the procedure was over, and I was still crying, I was offered tea and biscuits and was told that it was "for the best" as a blood clot had been found “somewhere” which meant the child may have been born deformed in some way. But that did not ease the horrific pain and regret ripping my heart apart. I wanted my baby back. I wanted that 'somebody' to have their life, and their chance at life, returned. I had never liked myself, but now I despised myself. I could not and would not forgive myself. I started drinking more, hating more, and caring about everyone and everything less - including my daughter, whom I had longed for, and planned to have, since I was about 12 years old. The anger and the guilt, and all things negative and harsh, took hold of my heart and would not let go, pushing me more and more to the point of pure hatred. At this time, I met a Christian who was determined to get me to accept Jesus. I had ‘known’ Jesus since I was a child, but as far as I was concerned religion was like marriage: It was for hypocrites! And, after awhile, I told this friend where he could shove his Bible. Soon after, I travelled to the other side of Australia, figuring a new start for my daughter and myself would help me forget the past and live again, but, there, I found more anger, more hatred, and soon headed back to New South Wales. No matter where I ran the deep-rooted negative emotions would not leave me, and every little upset that came my way after the day of the abortion added to anger I held. Back in New South Wales, I started dating an old friend, but I was too damaged to have a long-term relationship, and we soon went our separate ways. This added to my woe. I had wanted out of the relationship - a relationship I told myself I would never enter - but he pleaded with me to go back. I went back...and he found someone else and soon ended us again. More heartache. More tears. More anger. Enough was enough. Depression soon came calling and I longed to die. (A result of the open door to 'killing'???) I seriously contemplated suicide but I refused to take my daughter with me and I didn’t trust anyone else to take care of her. So I made a decision to wait until I was 40, then I would do it. When I turned 40 my daughter would be 21 and old enough to take care of herself. I would be free to suicide then. This was the only plan I could come up with that offered some sort of peace in my God-forsaken world. Yet, I still didn't want to live in a world without love. That night I went to bed and, not knowing it was the thing to do – and before crying myself to sleep - I prayed, asking God to forgive me for every wrong I had ever committed, and to forgive everyone who had wronged me. I asked that He would wipe the slate clean and help me start again. While I soon learned that God was willing, and had (through my act of repentance), forgiven me for the abortion, I could not receive that forgiveness nor offer it to myself. While God had responded to my prayer, met me in the gutter that was my life, picked me up, dusted me off, helped me start again, and gave me hope, it took a lot of wrestling with God, and many, many years and tears before I surrendered to forgiveness. God had did all I just mentioned and more, ad within months seen me married and starting a new [and combined] family, but I didn’t want forgiveness. I didn’t deserve it. Yet, He wanted me to have it. Hope. Love. Faith. A husband. A total of 6 children. All gifts from God, as was forgiveness, but forgiveness I could not bring myself to receive...but God's love, mercy and grace does not give up. He wants us free, and He will do all He can to ensure that we receive such freedom - as Jesus did, and does, too. So, I wrestled and cried, and He held me and wiped my tears. Eventually, I learned to receive forgiveness, and to forgive myself - in my heart, in prayer, I even ask my baby to forgive me - but the abortion will always be my greatest regret. Always. Several years after God met me in the gutter I was in, He urged me to record the meanings of the significant names in my life. This was years after I had asked God if my child had been a boy or girl, and asked Him to name the child for me. God had impressed upon my heart, and showed me in a dream, that that 'somebody' was a male; a boy; my son. And, upon me asking God to do so, He named my son “Mark”. At that time, I remember thinking, “Oh, he has definitely left his mark on me…” and now I was adding Mark’s name to the significant names in my life. Upon using the baby name book I owned, I learned that Mark means “Warlike”. Another long story short: God then impressed upon my heart, “When they took Mark out of you, the took the fight out of you, and death came in.” Death was what drove my anger. And that was when I realised what we do in the physical realm greatly effects the spiritual realm and our spirit far more than we realise it does. Our actions here and now have an effect far beyond what we can see – the good and the bad. And if we carry that sin, we will pay for that sin. Jesus is willing to take that from us, but it's up to us to give it to Him - and that upon asking for forgiveness. What right did I have to take a person’s life…? Who says that child, that 'somebody' -my son- had less rights to live than my other children? I miss him. I miss my son. I have never met him, never laid eyes on him, never touched him, but in my heart I know him; I feel him and I miss him. I would give anything to hug him; to hold him; to love him; to let him know that he is worth loving. I don’t ache over these things because of guilt anymore, rather, I ache because I LOVE HIM AND REGRET TAKING HIS LIFE FROM HIM. I regret that he never got a chance to live, to love, and to be embraced love as we know it here on earth. For years I suffered guilt, but that guilt blinded me to one powerful fact, and blinding me to that fact kept me imprisoned in 'self-pity’ mode: It was MY fault my child was aborted/terminated/killed. In being blinded to that fact, for a long time after the abortion I took on a victim mentality. I wept as though I was the victim. I lived as though I was the victim. BUT I WAS NOT. I was the perpetrator. My child was the victim. 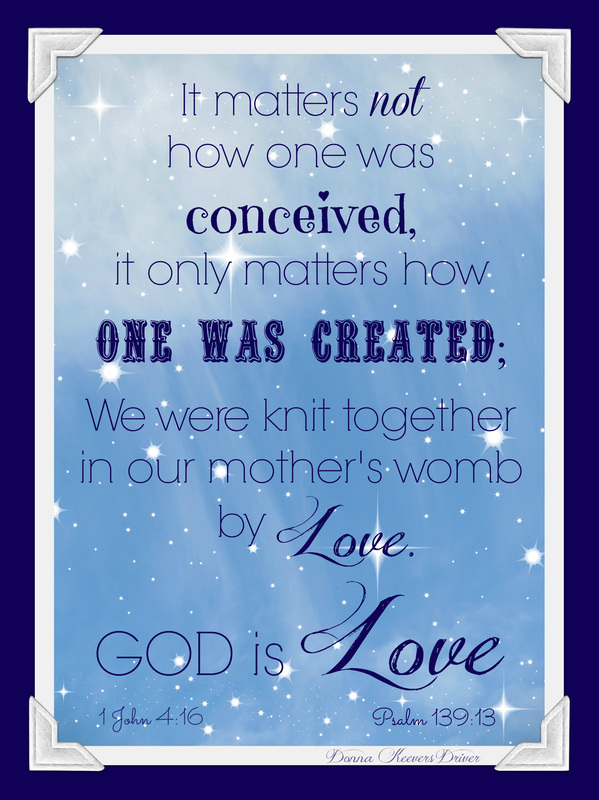 God created him in my womb, placed a LIFE inside my womb, entrusting that child to my care, and I killed him. My child was innocent. Defenseless. Sinless. And I killed him. He was the victim…not me! God restores. God forgives. God loves. God heals. God is merciful. If you are “guilty” of having an abortion, and are suffering emotionally and mentally -even spiritually because of it, God seeks to relieve you of your heartache. Just call on Him and He’ll come to help you. Jesus made a way to God. The door is open. Just walk through, into God’s presence. [It depends solely on your willingness to trust and seek Him…] He doesn’t want you weighed down with guilt, even if you are guilty. See, guilt is another form of murder, I reckon. It slowly kills you, bit by bit, hacking away at your soul, spirit and heart until death looks inviting. God doesn’t want you to live with that guilt. He wants to free you of it. Jesus died to take such sin and guilt from you. He is willing to carry it for you. God is not seeking to keep you condemned or crushed. Rather, He wants the opposite for you, and Jesus has made that possible. Again, it depends on your heart. Just cry out to Him. If you are contemplating an abortion, think twice. Think long. Think hard. Listen to YOUR heart. Then think again… Women have died from these procedures – not just the children. You may not die physically, but part of your heart and soul will. Abortion isn’t your only choice. There are thousands of people out there who cannot have children, looking to adopt. And there is financial help out there. Please, just think carefully, long and hard. And seek wise counsel, not ‘fearful’ voices. And if you have any faith that God does exist, pray. Pray long and hard. I trust that God will be there when you do, showing you the way that will benefit all involved. He will lead you and your child to love and blessings far greater than fear will allow you to see and accept. To Jesus you are a person worth dying for; someone He desires to set free of all that seeks to destroy you… and so is your child. With ALL my heart, I pray and trust God meets you where you are at, and helps, encourages, and blesses you in every area of your life. Just open up your heart and let Him. He's on your side. When I posted this blog, I did so in a page that doesn't allow comments. I regret that now, because, almost 12 months after the comment below was posted, I just found it. Sara, forgive me for not replying. You are in my heart and prayers. *I would altered this blog to accept comments, but the page doesn't allow it. Please press on the "F" link above to find me on Facebook.